The only thing that i will add here is that i suspect that the gland respond to the ultraviolet part of the spectrum. This acts as a form of triangulation with our eyes and allows our color reciprocity to be calibrated. Tamarind acts as a natural fluoride remover and that is noted. I am now adding it to my ginger tumeric tea just because i can and it is easy to brew up a week's supply to add to ordinary tea or even cocoa. Obviously interest in the pineal gland is becoming mainstream as well and this data is useful. The famous philosopher Descartes described the pineal gland as the “principal seat of the soul.” You’ve probably heard of this gland being the ‘third eye,’ a mystical chakra point residing right in the middle of your eyebrows. Well, it turns out these ideas aren’t too far off. 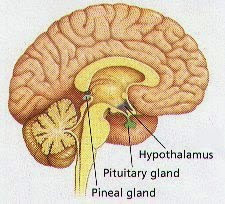 The small, rice-sized, pinecone-shaped endocrine organ known as the pineal gland sits alone in the middle of the brain and at the same level as the eyes. Sun exposure kick starts the pineal gland to produce serotonin and stimulates the mind. Any type of light exposure, either directly or indirectly, activates the pineal gland, prompting it to produce serotonin. This neurotransmitter is responsible for mood and improves energy levels. This is why it’s crucial to avoid light after the sun goes down, because you need your pineal gland to produce melatonin and suppress serotonin. This process can only be accomplished by reducing light from electronics and lightbulbs as much as possible. Sun gazing is perhaps one of the most controversial exercises you can do to activate the pineal gland, simply because there’s no scientific evidence to prove its effectiveness or safety. Here’s the basics of the practice: within the first 15 minutes of sunlight at the beginning of the day and then the final 15 minutes of sunlight at the end of the day, you gaze into the sun for a couple of seconds, but only a couple of seconds. Again, sun gazing has its risks. Simply getting out in the sun and having your eyes exposed to light indirectly can help stimulate the pineal gland without having to stare directly into the sun’s rays. Halides like fluoride, chlorine, and bromine accumulate in your tissue if you’re iodine deficient, which is an increasing problem around the world. If you’ve cut back on salt and don’t eat a lot of seafood, there’s a good chance you may be deficient. Symptoms of iodine deficiency include chronic fatigue, thyroid disease, feeling cold or a low body temperature, and hormone imbalance. To get more iodine, eat foods rich in iodine, [link to article on sources of iodine] or take a colloidal iodine supplement for the best result.